Run the longest continuous sidewalk in the United States, while enjoying splendid ocean views! Seawall Urban Park is the name for the 10+ miles that run along Seawall Blvd. on Galveston’s eastern shore. The road is so-named owning to the seawall below the road that protects from the crashing waves of ocean storms. There is a sidewalk the entire way, with continuous views to the waters of the Gulf of Mexico. The road itself is quite busy, with two lanes of traffic in each direction. But it’s a festive scene on a busy day, with restaurants, shops, and lots of people walking, running, and biking. The western end of Seawall Blvd. starts at Diamond Beach at the Breakers. 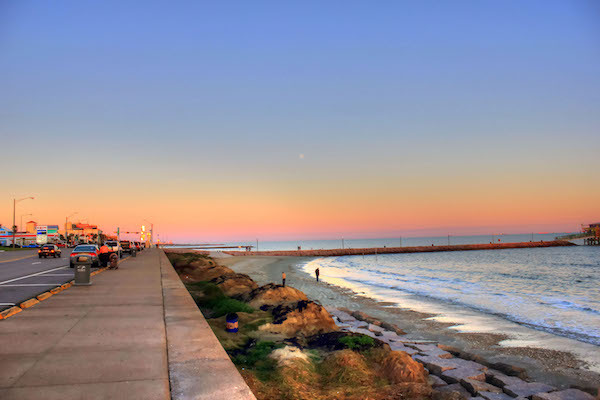 The heart of Galveston’s more developed downtown & historic district is between miles 3-7, heading east. At 25th St., take a jaunt out to the historic Galveston Pleasure Pier (0.6 mile out and back, crowded on a busy day). Heading further east, Seawall Blvd. turns away from the ocean at Mile 7 — here, the route becomes a bit greener and less developed, with views out to some tidal marshes. The eastern end of Seawall Blvd. is at Fort San Jacinto Historic Point, but one can continue for another mile along Boddeker Rd., to East Beach Park. Add-Ons/Options: The beach along here is also runnable, but occasionally interrupted by jetties and so on. Can also head into downtown Galveston’s historic sections. It’s all fairly compact. Any point along seawall. South End: Diamond Beach. North End: Fort San Jacinto Historic Point.